Do you experience brain fog, low energy and are unable to lose weight? 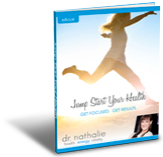 Are you suffering with hormonal imbalances, poor sleep, premature aging or anxiety? 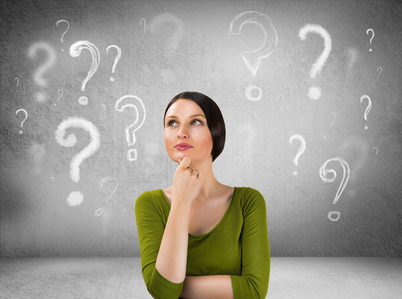 Are you having trouble finding answers to your rising health concerns? The answer may lie beneath how much toxicity lies within you. digestion, memory and much more. Oftentimes these patients are doing a lot of the right things like exercising and eating fairly well, but are unaware of the amount of toxins they are exposing themselves to on a daily basis which are preventing their bodies from functioning optimally. I’ve invested the last 2 years in advanced studies with a curriculum encompassing the work of revered and progressive medical experts, true scientific pioneers, and renowned biochemists and the answers are as plain as day. If toxins are the cause of most chronic disease, a true detoxification is the open door to healing. In order to provide my patients with real solutions to get rid of these toxins, I have paired up with Dr. Dan Pompa, founder of True Cellular Detox, to help bring you the most cutting edge real detox program. Patients experiencing TRUE Cellular Detox find their insomnia becomes a thing of the past. Mood elevates almost instantly. Productivity returns. Feelings of joy return. Every system of the body begins to function better. The body begins to happily burn fat. The human machine simply begins working as it was intended. 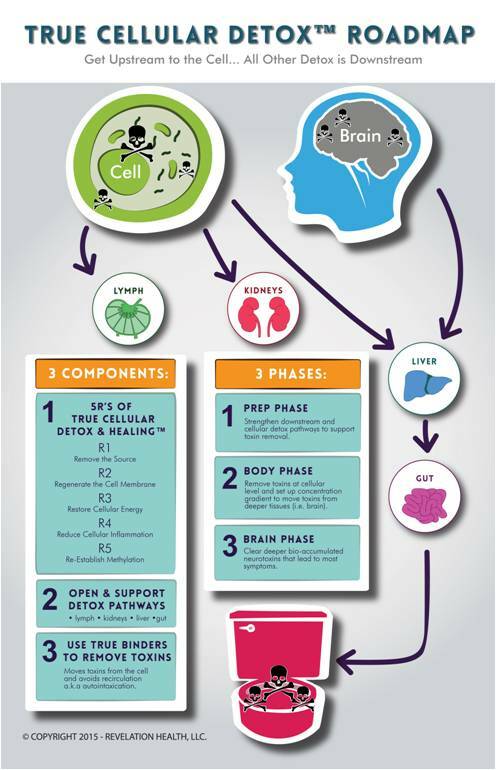 So, what is the True Cellular Detox Program? Use true binders to remove toxins out of the system for good. Phase 3 – Brain Phase: To clear deeper bio-accumulated neurotoxins that lead to most symptoms. Cellular Vitality Phase: This phase of supplements is to be taken after completing the three phases of the True Cellular Detox™ program. This formula contains the perfect cellular nutrition that everyone needs in today`s toxic world. It is the multivitamin of the future that was formulated to maintain cellular detox pathways, replacing your multivitamin and fish oil. In addition to this, True Cellular Detox Includes a full 90-day meal plan, smoothie eBook, and over a dozen articles to help give you the most in depth insight into common issues such as heavy metals, diabetes, endocrine disruptions, sleep and anxiety, leaky gut, vitamin deficiencies, and household toxins. If this isn`t enough, we have also included tips and strategies to take your health to the next level through dietary variation and exercise strategies. 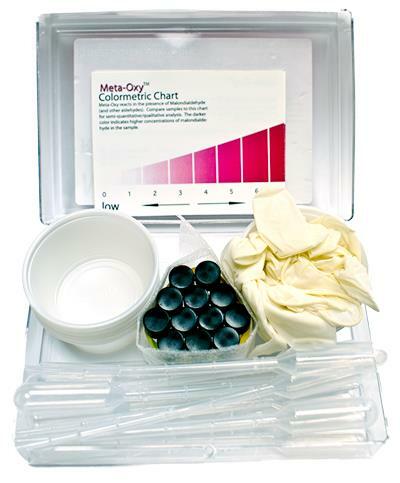 1 – Meta-Oxy Test: The Meta-Oxy measures malondialdehyde in the urine, which is a marker for oxidative stress and cell membrane damage due to free radicals. The level of malondialdehyde in the urine indicates the amount of oxidized fat; therefore, themore malondialdehyde measured in the urine, the greater the amount of cell membrane damage. 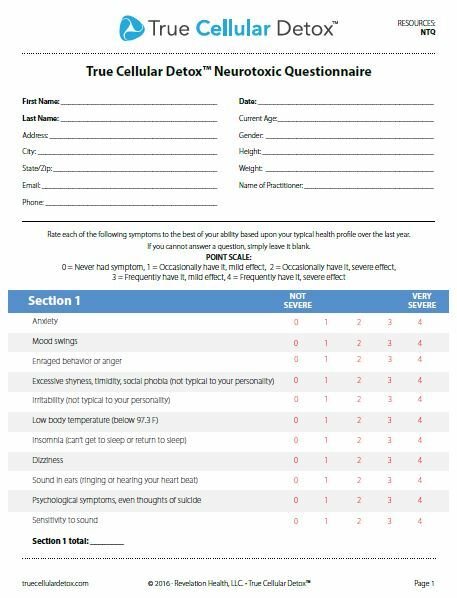 2 – True Cellular Detox™ Neurotoxic Questionnaire: True Cellular Detox™ Neurotoxic Questionnaire is another great test in the True Cellular Detox™ system and a simple and effective way to determine a patient’s neurotoxicity and mark progress. The test contains a series of questions that relate to heavy metal toxicity, biotoxic illness, and general toxicity issues. It also goes over medical history, and other health related factors that will give greater insight to just how much toxicity may be present and what precautions to take during the True Cellular Detox™ Program. the brain has to have the ability to detect contrast between stimuli. Because vision is interpreted in the occipital lobe of the brain, poor performance in detecting contrast in faint colours may display neuotoxicity. In later stages, it can cause blurred vision and other functional problems. The VCS test allows us to get a better idea of exactly what kinds of toxins (i.e. mold, lead, mercury etc) may be causing your symptoms and just how severely. 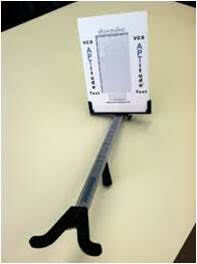 If the test is failed, this is a great indication that the patient is affected by the corresponding toxins. Buy a Screening Session with our Trained True Cellular Detox Personnel TODAY! Click the button below to buy and book your consultation with our trained True Cellular Detox Personnel. Don’t wait any longer, discover true natural health solutions that will give you the health, energy and vitality you want to do the things that are important to you. P.S. True health is possible. Don’t wait, buy the screening today.